The sun was beaming down as we awoke but by the time we were up and showered, Amsterdam was pretty overcast. Check out at the hotel wasn't until 12 so with a lot of persuasion David and I decided to go to the Diamond Museum, since they're a girls best friend and all. The area around Centraal station was absolutely heaving with Saturday morning arrivals and we couldn't find the museum in enough time to explore and get back to the hotel in time for check out, so we just went for a coffee instead. The drive to Antwerp felt longer than 2 hours, but it was really nice to see more windmills along the route. They are much shorter than I thought they would be? We passed over the Rotterdam bridge and glanced over the big industrial buildings, before arriving at the Belgium border and into Antwerp. There seemed to be a cycle race on through the city so we were delayed and had to take a few diversions, but all was well, I sang a bit more Frozen, and then we arrived at the wrong Ibis hotel- just goes to show how tired we all are. 15 minutes later we are at our not quite to swanky Ibis Budget hotel near Centraal Station. 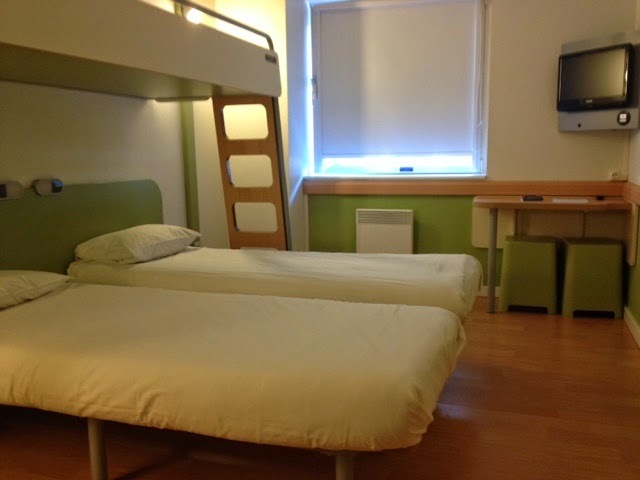 Our room is completely fine for a quick stay, it's the same as our one in Nice but it's fine. There is plenty of room to move and the hoist can easily fit under the bed, but the overhead bunk means it's difficult to use the hoist to get higher up the bed. The room and bathroom are both quite modern with nicer light fixtures than before. 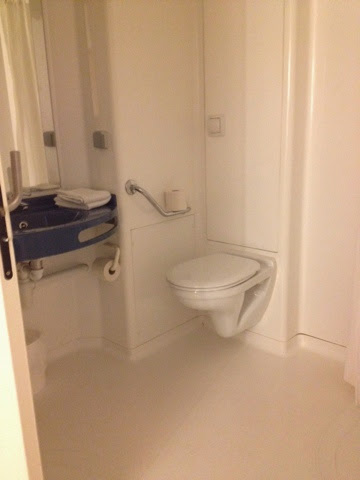 Bathroom is a good sized wet room with grab rails, no pull cord as far as I can notice. 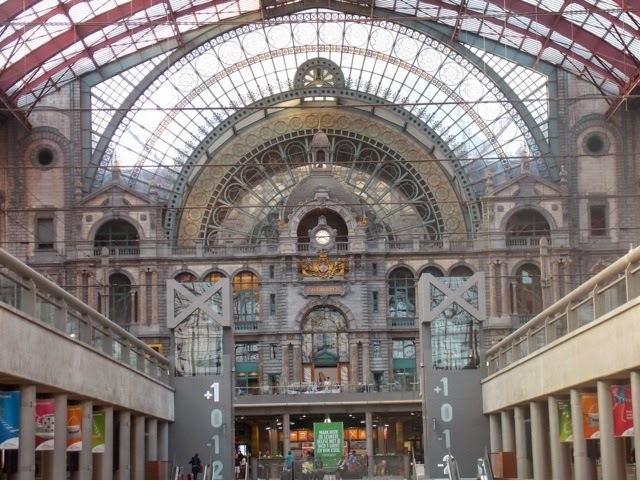 We strolled into Antwerp through the Centraal station which is an absolute must for anyone visiting this city. I have never seen a station so pretty! 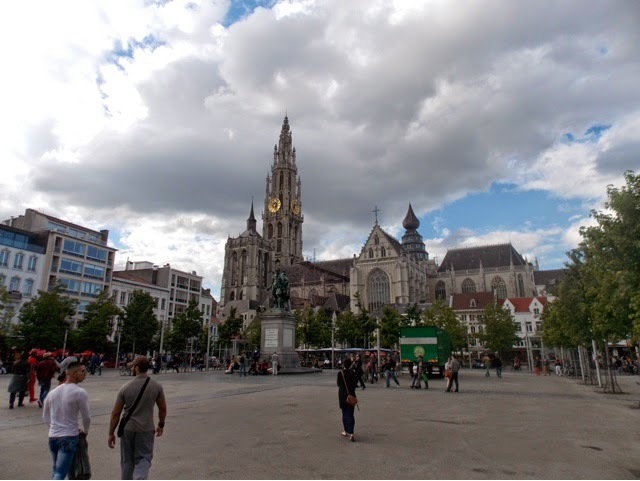 There are lots of diamond shops along the Centraal area which caught my eye, and then onto the main shopping district which Antwerp is becoming famous for. We veered off and found a few courtyards surrounding cathedrals where we had dinner. Nothing fancy tonight, but a good sized bowl of seafood pasta at an Italian place called Da Giovannis, perfect.